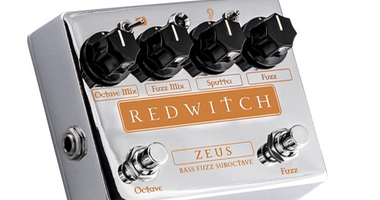 First thing to notice and mention is that the Zeus is a dedicated bass pedal with no roll-off in the low end and with two independent blend knobs. That is a very good starting point in this reviewer’s opinion. So almost needless to say that I was very curious to try out this stompbox. I should also mention that octave pedals in general are capable of isolating the lower octave and thereby create a subby and synth-like tone. 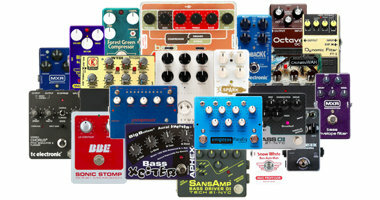 However, I decided not to add octave pedals to the Synth category. 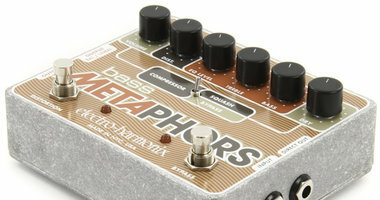 Having said that, if a pedal has some additional possibilities that allows you to create even more synth-like tones they may be included in that category. The fuzz circuit and not least the dedicated SPUTTER control of the fuzz part help creating some pretty brutal synth tones (you can hear these in the third round of sound clips). The Zeus consists of two entirely independent circuits and effects: analog octave and fuzz. The left knob controls the blend between the clean tone and the octave below – hence it is named OCTAVE MIX. The second knob from the left does the same for the dry tone and the fuzz effect and is, logically, named FUZZ MIX. The knob to the right simply controls the amount of FUZZ. Now, the second knob from the right is interesting and named nothing less than SPUTTER. What it does is to emulate bias control and it works backwards in the sense that when turned fully clockwise, there is no effect and as you turn it counterclockwise, the sound becomes more and more staccato – or sputtering. On top of that, you will also find two nameless 2-way switches that relate to the fuzz circuit only. Each is coupled with a symbol and the left one is neutral in the left position, but when you flick it to the right – towards the LIGHTNING symbol – you double the gain in the FUZZ circuit, making the tone really hairy and brutal. 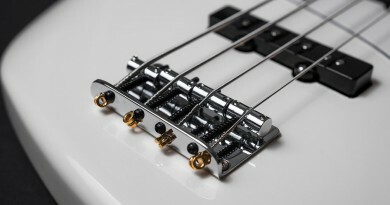 The right switch is neutral in the right position, and when you switch it toward the EAR symbol the high frequencies are increased for added clarity. Finally, the LED needs a few comments. It is in fact a 3-color LED, and you can activate each of the two circuits independently of each other. Now, if you engage the OCTAVE part only, the LED lights up blue. When you use only the FUZZ part of the pedal, the LED is orange, and if you use both at the same time, the LED becomes purple. Once you decode that color coding system, it is really cool indeed. The sound clips section in this review is divided into 9 parts. Overall, the OCTAVE and FUZZ circuits are covered one by one, but of course with some blending along the way, as there are lots of golden tones hidden in the ‘grey zones’. The Zeus is extremely versatile. 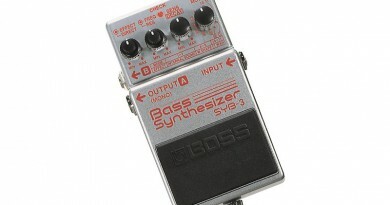 Fundamentally, you can create at least 4 core tone types: 1) octave, 2) solo octave (synth), 3) fuzz and 4) sputter fuzz. But you can mix and match almost endlessly with this pedal and there are literally hundreds of useable, no desirable, tones to be discovered. For instance, I love the classic octave sound, but with just a tad of dirt added – blended in so carefully that you can hardly hear it. In fact, you mostly notice it when you dial it out again and there is something fundamental missing all of a sudden. Also, the EAR switch is a lifesaver, as it gives you just the right amount of bite and clarity 9 times out of 10. The 10th time it may just get a bit to clanky, but it also depends heavily on how much FUZZ you have dialed in. The classic synth trick – isolating the lower octave – works beautifully and it is often paired with an overdrive or fuzz pedal, but in this case you get everything in the same pedal. And that SPUTTER knob is just killer. Either as part of the FUZZ without the OCTAVE, and just as awesome when added to the isolated octave for a gnarly and biting synth tone. The quality is top notch. 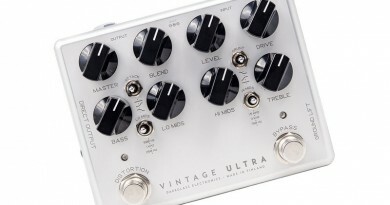 I have no long-lasting relationship with this pedal (but I foresee one coming up! ), but it seemed extremely solid and everything just oozes quality. From the polished surface to the classy denim bag it is delivered in. Knobs are firm, connectors tight and the knobs are easy to read even at a distance. There are no chances of cord clutter with the INPUT on the right side, the OUTPUT on the left and the 9V power supply input on the rear side. If you want to, you can also power this one up with a 9V battery. The only thing to mention, design-wise, is the size of the pedal, but with two footswitches, you need a certain size of housing. That said, for instance Black Cat managed to squeeze in two footswitches, 4 knobs and an LED in a ‘standard’ Boss or Wampler sized pedal. There are also the two switches, of course, and I actually like the big knobs and will not let the slightly enlarged footprint drag this brilliant pedal down. Today (2016), a new Zeus retails from $260-300. It may not be in the ‘impulse purchase’ category, but the tools you get is well worth the price. This is one of the relatively rare cases where I’d like to emphasize that I would never let a poor sounding pedal score high because it is dirt cheap, but I will let an expensive pedal score high as long as it delivers sound, quality and versatility accordingly. This is such a case. I love this pedal, and it will stay put on my board. 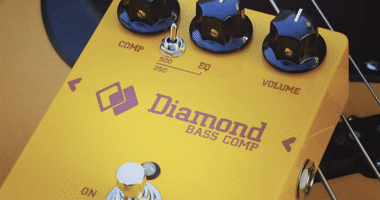 It was born for bass with a full frequency response range and blend options for both circuits, which is a lifesaver for bass players. It does the classic octave sound, a great synth tone, tons of cool fuzz variations and allows you to mix and tweak as you see fit. I am sure you will discover several tones you never knew existed once you get started. I know I did!